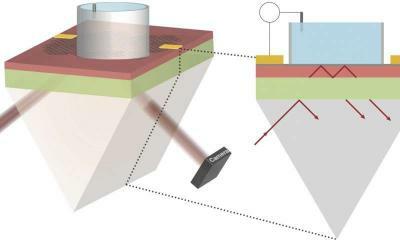 In this study, the team first used infrared light produced at Berkeley Lab's Advanced Light Source to understand the effects of an electric field on graphene's absorption of infrared light. 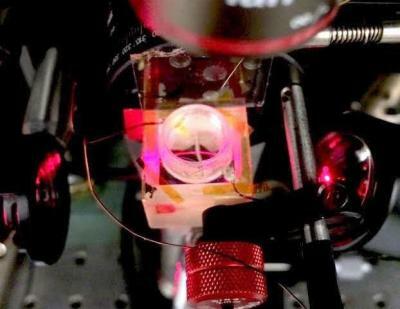 In the experiment, they aimed an infrared laser through a prism to a thin layer called a waveguide. The waveguide was designed to precisely match graphene's light-absorbing properties so that all of the light was absorbed along the graphene layer in the absence of an electric field. Researchers then fired tiny electrical pulses in a liquid solution above the graphene layer that very slightly disrupted the graphene layer's light absorption, allowing some light to escape in a way that carried a precise signature of the electrical field. Researchers captured a sequence of images of this escaping light in thousandths-of-a-second intervals, and these images provided a direct visualization of the electrical field's strength and location along the surface of the graphene. The new imaging platform—dubbed CAGE for "Critically coupled waveguide-Amplified Graphene Electric field imaging device"—proved sensitive to voltages of a few microvolts (millionths of a volt). This should make it extremely sensitive to the electric fields between cells in networks of heart cells and nerve cells, which can range from tens of microvolts to a few millivolts. Researchers found that they could pinpoint an electric field's location along the graphene sheet's surface down to tens of microns (millionths of a meter), and capture its fading strength in a sequence of time steps separated by as few as five milliseconds, or thousandths of a second. In one sequence, researchers detailed the position and dissipation, or fade, of a local electric field generated by a 10-thousandths-of-a-volt pulse over a period of about 240 milliseconds, with sensitivity down to about 100 millionths-of-a-volt. The scientists stated that there are already plans to test the platforms with living cells. "We are working with collaborators to test this with real heart cells". "There are several potential applications for this research in heart health and drug screening." There is also potential to use other atomically thin materials besides graphene in the imaging setup.